Anyway…awesome letter. Didn’t see stuff like that in the old letter columns too often. Pretty much par for the course now, in some corners of the nerdinet. 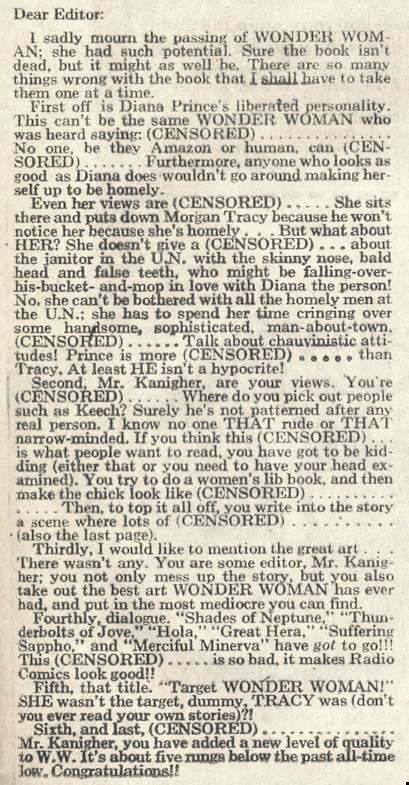 I guess Ain’t It Cool News was running Wonder Woman’s letters column back in those days. Stylistic concerns of the letter aside, those were legitimate complaints. I never knew Harlan Ellison wrote in to Wonder Woman. Those letter writers are obviously the grandparents of today’s current crop of youtube commenters. I was reading WW in that period, and the letter comments, as far as I can remember, were (CENSORED) right. It is kinda like Mad Libs. I would play, but I can’t figure what part of speech each blank is supposed to be. Egads. I actually remember that one. Hmmm…. I wonder if I still have that issue. Okay, I checked. Alas, no. I kept only the ones I liked. Thus, I have a gap between 202 and 216. 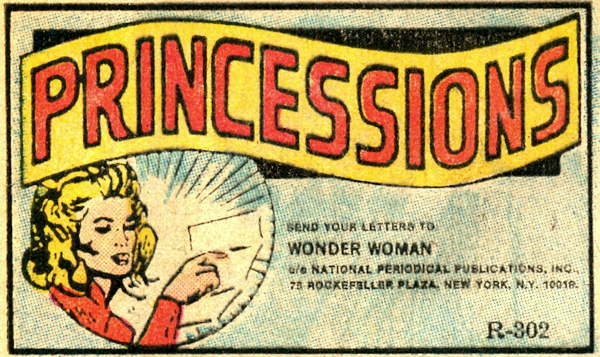 BTW, the lettercol in 202 is Wonder Woman’s Write In (ick) and 220 is Wonder Words (much better). The books have different cover logos, too, since they cover different versions of Diana, 202 being during her powerless phase and 216 after she regained her powers. Black Canary guested in the latter.